As Chinese New Year is just less than 30 days away, I am in the mood to make some Chinese New Year treats for the celebration. A Chinese New Year treat are normally sweet, which symbolize a sweet and happy year ahead. 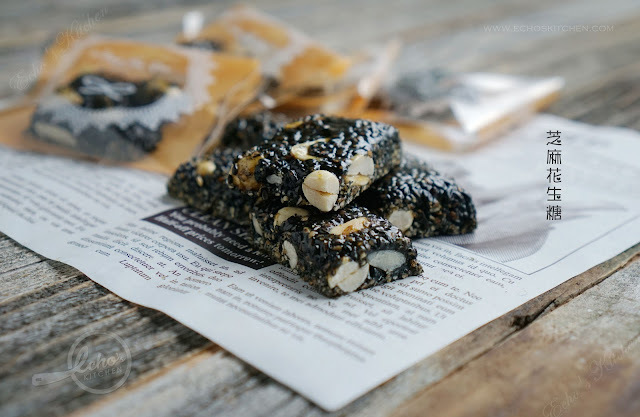 I made a batch of this Black sesame peanut brittles, similar to the Peanut Sesame Chikki that I have made before. I am a freelancer and I have to go to downtown Manhattan often time for work, one of the reason I liked working in NYC despite the dreading commute is the foods out there. 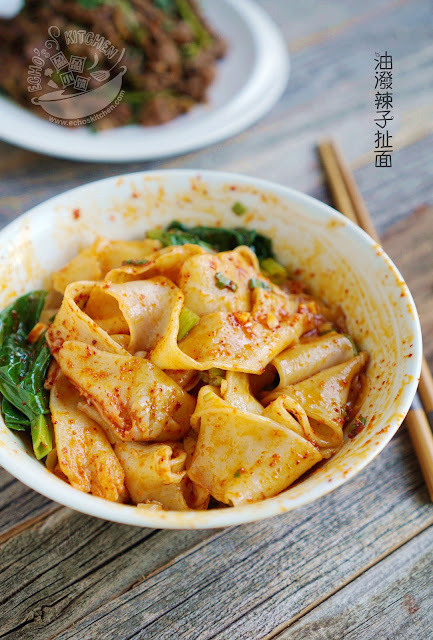 One of the place I really liked and will definitely visit is this small restaurant called "Xi'an Famous Foods" which is known for their Western Chinese cuisines. 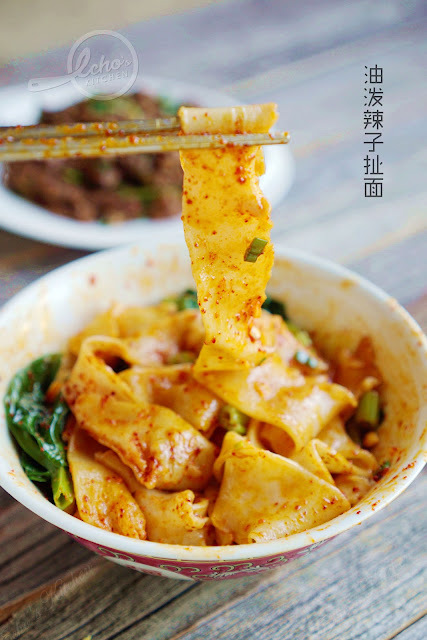 I love their signature hand-ripped noodle, some called it "Belt noodle" (裤带面) very much, the texture of the noodle is chewy and very flavorful. On this long weekend I attempted this noodle twice and I have to say, I got the texture and technique right the second time! On this very day every year, we will all gathered around in the kitchen to help mom rolling the rice ball. It was my first experience of making edible balls, it should also be for many kids in my country. 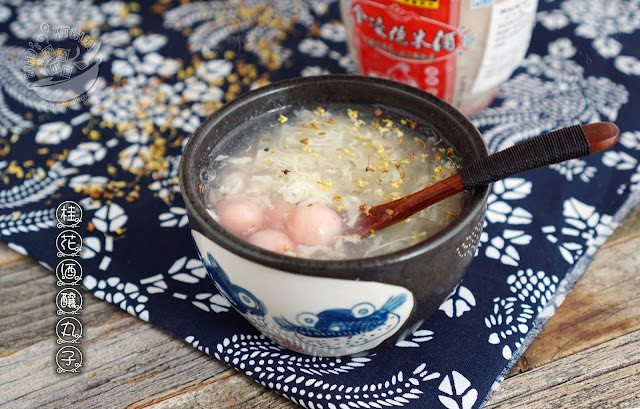 Mom will then boil the rice balls in a pot of water while preparing another pot of ginger and pandan leaves infused syrup, the rice balls will then be served in the syrup as our afternoon snack. 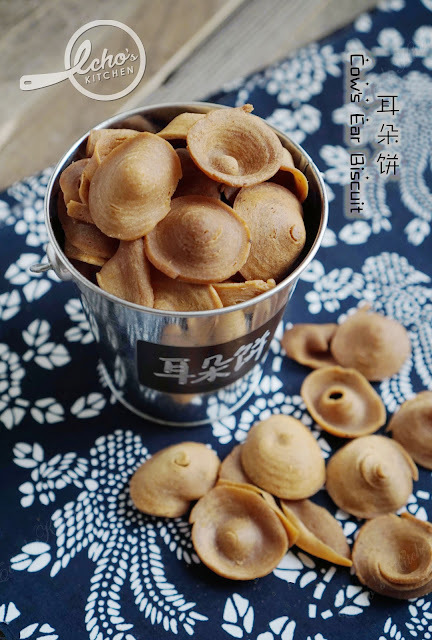 I loved playing with the dough and making it into balls and have countless memories and laughters making it with my siblings. I wanted to recreate a similar experience for my son A. 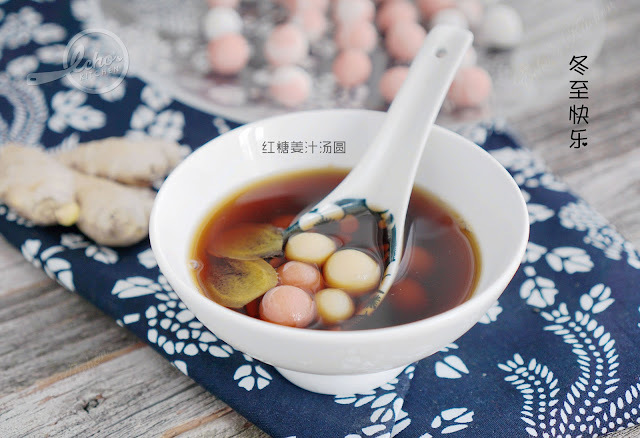 We woke up early today to make Tang Yuan while playing the song "卖汤圆" song at the background, it was fun! A friend of mine invited me over for Halloween dinner, thus I decided to make something pumpkin for the event. Half of the mustard greens that I harvested from my backyard earlier were made into Mustard Green Rice/Dua Cai Peng the remaining half were made into this congee 2 days later. 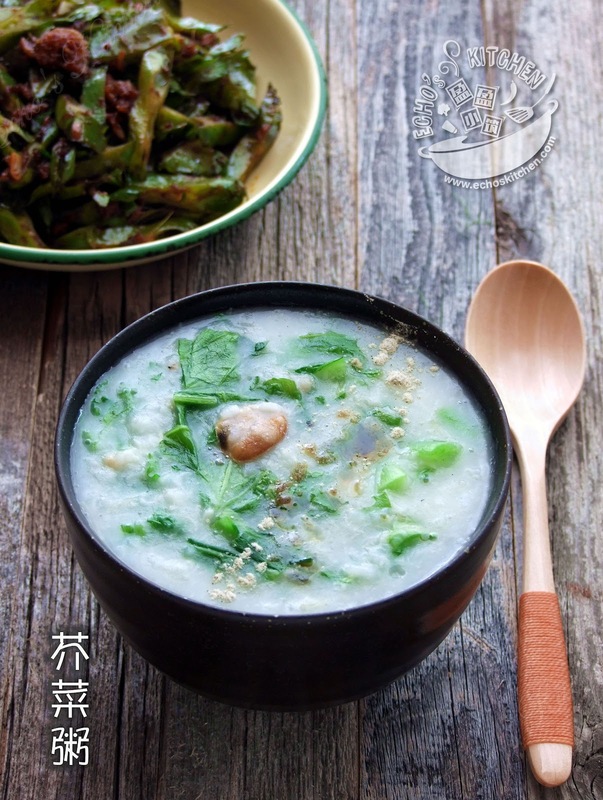 A very healthy dish to let us eat more vegetables and warm the body. 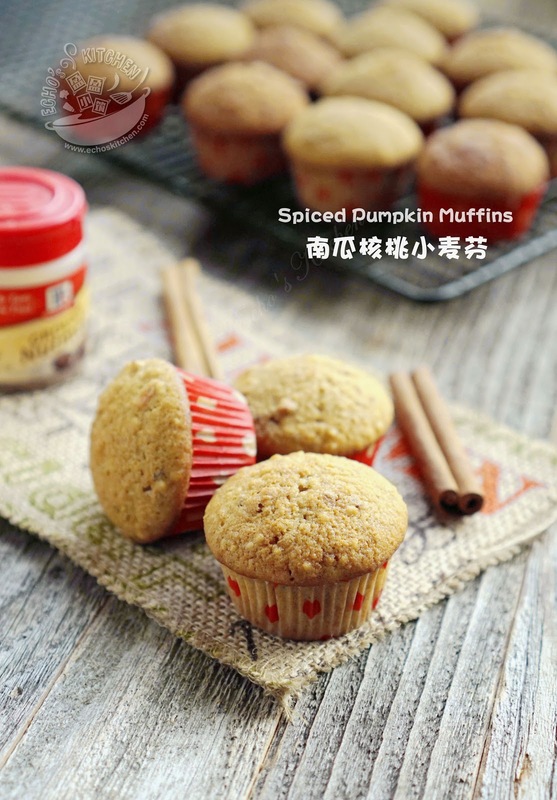 I like pumpkin and was amazed by the varieties we have in the USA. 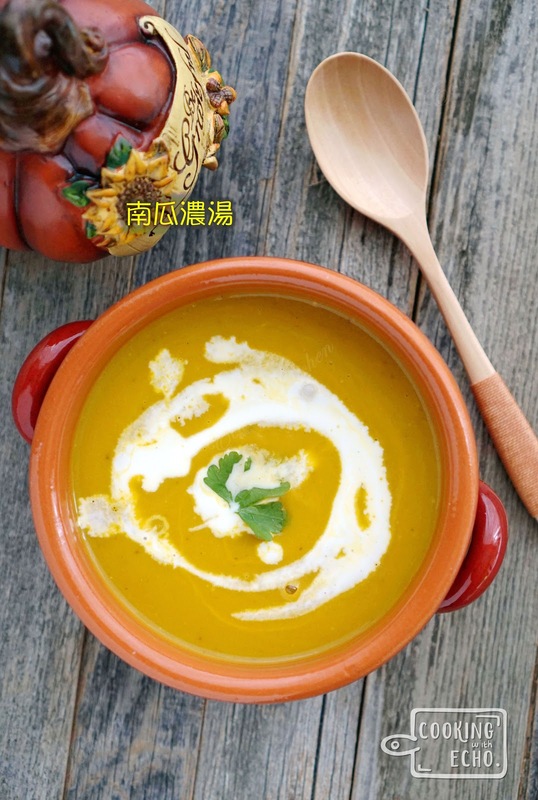 I like making pumpkin soup during winter, it warms the body and nourish the soul, it's perfect for a light and simple dinner! 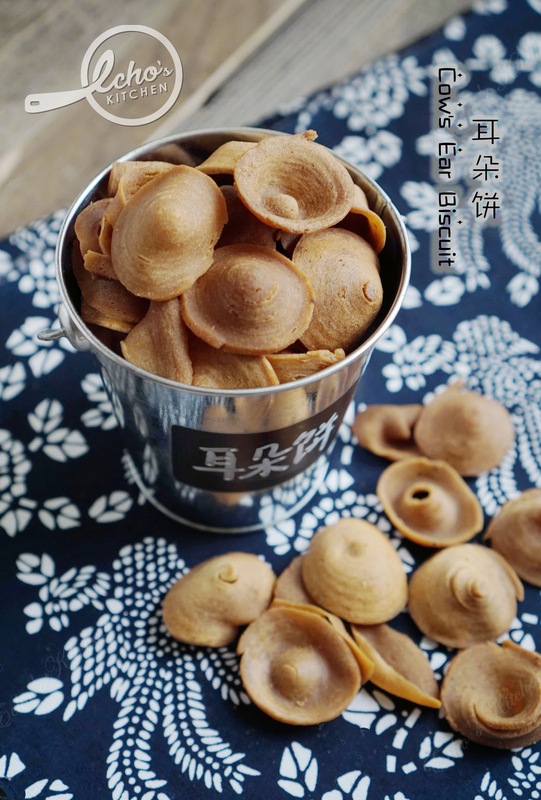 This spiral ear biscuit brings back feelings of nostalgia, it is one of my favourite snacks when I was a kid. It is savory, hard yet crunchy and is very addictive. 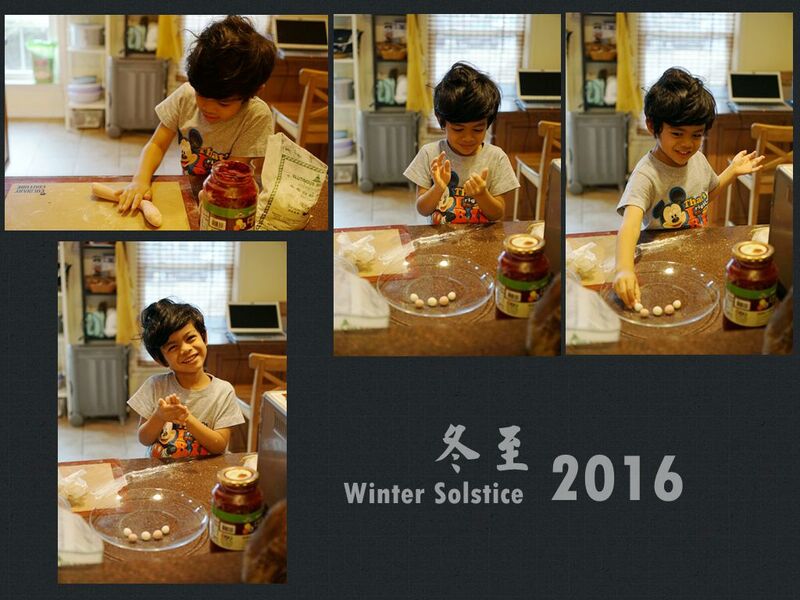 Mom sent a few packets of this biscuit with auntie Lisa not long ago, my son A enjoyed it and was asking for more. I got curious and started searching online for a recipe. I made the first batch with the recipe I found online, it turned out good, but lack of the taste of fermented Tofu (Fu Yu) and was a tad too crunchy for what I remembered. I modified the recipe and came up with another batch. This time the taste, shapes and looks turned out just the way I remembered! I am so so pleased. Here it comes another pumpkin dish made with the pumpkin planted by Auntie Lisa. It is again very dry and cold these days. 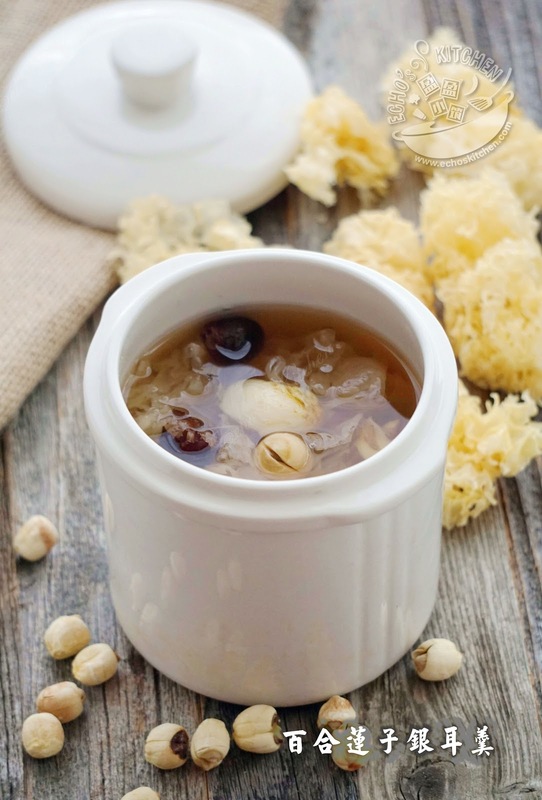 I will made this white fungus soup, it helps me fight cold and dryness. 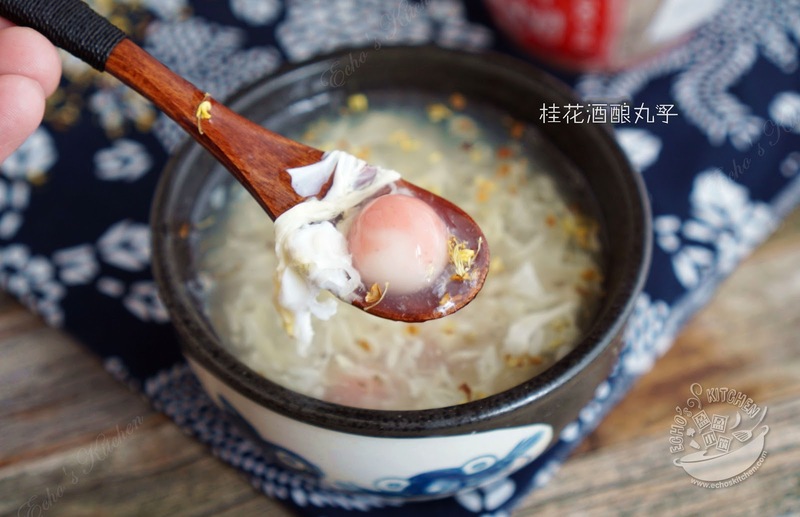 Note: White fungus or snow fungus is a slight yellowish dried fungus, after soaking and cooking it will become white and almost translucent in color. White fungus is believed to be a good immune stimulant, it fights infection, inflammation, cold and cough, studies have also found that it has anti-tumor property, could lower levels of low-density lipoprotein (LDL, or the "bad"cholesterol). 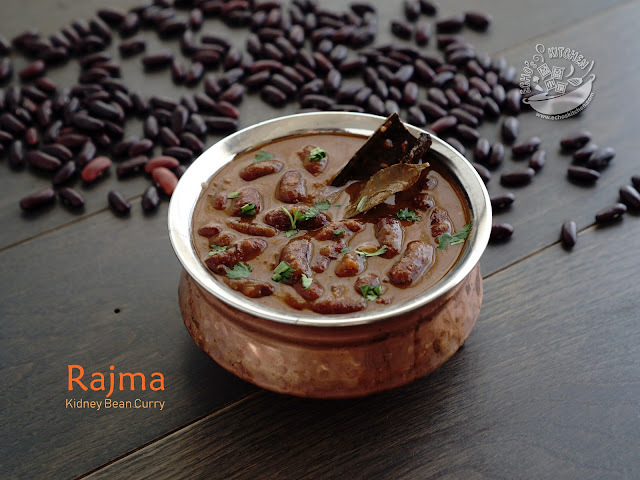 It is also believed to slow the aging process, though I am not sure if there is any scientific research supporting this! Fall and winter are both very dry seasons.I for one always suffer dry and itchiness during these seasons. Lotions or oil won't help much. This sweet soup is supposed to help prevent dryness during cold weather. It is a pretty good breakfast too! 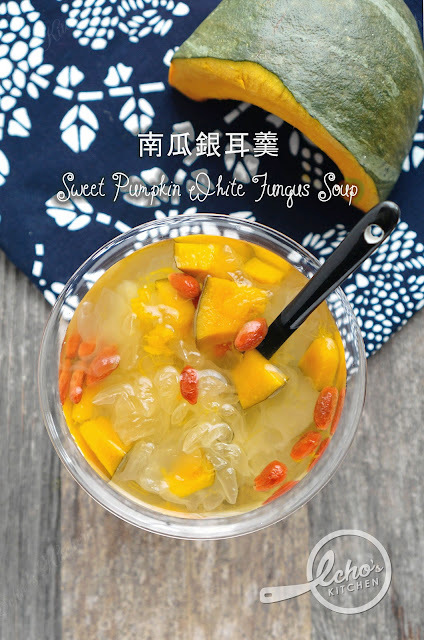 I learnt to enjoy Cantonese soups from my cantonese flatmate when I was in England. I also think a good pot of soup can only be made using claypot. I have been wanting a good claypot for a long time now and did not see anything of my liking, until one afternoon when I visited Chinatown in PA, I saw this simple claypot sitting right on top of a shelve. and I knew that it is mine.